The smaller D-segment has a lot to offer luxury buyers, but you’ll have a hard time finding a better looking offering than the new Jaguar XE. Even in base Premium trim it’s a heartthrob, combining every essential Jaguar styling cue from its larger siblings with a sportier stance that can be underpinned with plenty of wheel and tire options. So far I’ve driven the top-tier XE 35t AWD R-Sport with its stunning 20-inch optional alloys, as well as two 20d AWD powered versions in mid-range Prestige trim, this most recent and likely final 2017 model getting a few upgrades over the previous version, most noticeably its gorgeous set of twinned five-spoke diamond-turned 19-inch alloys in place of the previous model’s 18s, $2,000 well spent. As you can see they’re perfectly matched against as-tested Indus Silver metallic paint. Inside, my previous 20d AWD Prestige model’s mostly Jet black cabin gets replaced by a less orthodox Light Oyster treatment, consisting of a medium-grey dash top, steering wheel, and door panels combined with lighter grey for the lower instrument panel, door inserts, roofliner, and seat upholstery. The latter was even detailed out in subtle yellow green stitching instead of the previous car’s light copper brown thread, while $400 worth of more traditional Gloss Figured Ebony Veneer, a beautiful dark grained hardwood, replaced the standard Dark Satin Brushed aluminum and piano black lacquered composite. Jaguar offers a Jet black and Latte beige motif if that’s more to your liking, also no-charge, but I must say the two-tone grey affair was particularly handsome when matched up with the dark hardwood and all the standard brushed and chromed metals. Overall, the XE’s cabin is beautifully designed and exquisitely finished, with some impeccably crafted genuine metal trims including some lovely knurled detailing. Some notable positives include a classic set of metal-rimmed dials within the primary gauge cluster, these flanking a tall, colour TFT multi-information display at centre. Jaguar fills this MID up with plenty of fast access functionality, although a much more comprehensive and fully configurable 12.3-inch digital instrument cluster will be available in next year’s Tech Pack-infused XE. The current $2,600 Tech Pack replaces my tester’s 8.0-inch InControl Touch infotainment touchscreen, the same as found in base Premium trim, with the larger 10.2-inch InControl Touch Pro widescreen display I previously tested in R-Sport trim, this featuring a surround parking monitor, quicker-responding SSD-based navigation with 3D mapping, a Wi-Fi hotspot, 825-watt 17-speaker Meridian audio, plus connected services including a route planning app for door-to-door navigation that shares your ETA with specified contacts, a Commute Mode that learns your regular routes, automatically advises of expected ETAs based on live and historical traffic data, and then reroutes if necessary, an Arrival Mode that displays 360-degree street level imagery of your destination so you can visually find your way, and more. Still, my tester’s simplified infotainment didn’t leave me stranded, its navigation mapping clear and precise, its active guideline-enhanced reverse camera highly visible, its 380-watt 11-speaker Meridian audio system with Bluetooth phone connectivity with audio streaming and HD radio considerably better than class average, and the digital interface controlling its standard dual-zone auto climate control very well organized and easy to use. The driver’s seat was notably comfortable too, while the majority of front occupants should find the XE very roomy. Seated in back I had at least four inches available in front of my knees when the driver’s seat was set for my five-foot-eight medium-build body, plus about three inches available over my head, which should make either rear outboard position good for someone about six-foot-two, but as is usual in this class the person in the middle needs to be a bit smaller. Right about now I should detail out some of the 2017 XE’s standard and optional features not yet mentioned. Premium is the base trim, complete with turbo-diesel power and AWD, resulting in an entry-level XE starting at $45,000 plus freight and dealer fees, while including 17-inch alloys, LED taillights, power-folding auto-dimming heatable side mirrors with memory, pushbutton ignition, an electromechanical parking brake, a leather-wrapped multi-function steering wheel, rain-sensing wipers, Meridian audio, 10-way powered front seats with driver’s side memory, leather-like Luxtec upholstery, a powered moonroof, a universal garage door opener, flexible 40/20/40 split-folding rear seatbacks that expand the usefulness of a 450-litre trunk that’s already plenty large, and more. Prestige trim, which starts at $49,500, adds 18-inch alloys, proximity-sensing keyless access, metal front treadplates with “JAGUAR” branding, a softer grain leather steering wheel that’s also heated, a powered steering column, four-way powered lumbar support for front occupants, heatable front seats, leather upholstery, the aforementioned navigation and infotainment apps, a backup camera, voice recognition, LED mood lighting, etcetera. Of course, Jaguar offers extras for either trim, with Premium models having the option of the same 18-inch alloy wheels found standard with the Prestige for $1,500, and the same softer leather steering wheel with or without heat, but the heated version requires the $1,000 addition of a Cold Climate pack with heated front seats, a heated windshield and heated washer jets. A $2,300 Vision Pack adds brighter HID headlamps with signature LED “J” blade DRLs as well as auto high beams, adaptive cornering functionality, and washers, as well as front and rear parking sensors, plus blindspot monitoring with rear cross-traffic alert. Finally, standalone features for base models include the same heatable windshield from the Cold Climate Pack for $400, the Prestige model’s navigation, apps and voice recognition for $800, satellite radio for $450, and Wi-Fi for $350. With respect to my Prestige tester, all of the Premium model’s standalone features not already included can be added for identical pricing, plus the aforementioned 19-inch alloys, dark hardwood cabin inlays, and a head-up display unit for $1,000, while grouped options include the just noted Vision Pack, a $2,000 Comfort and Convenience Pack that includes ventilated front seats and heatable rear outboard seats, plus a powered rear sunshade and powered trunk lid, and lastly a $1,500 Black Design Package that adds gloss black 18-inch alloys before dousing the grille, front fender “power vents”, and side window surrounds in glossy black paint. Of note, both Premium and Prestige trims can’t be had with advanced driving assistance systems like autonomous braking, active lane keeping assist, etcetera, these arriving for 2018, but top-line 2017 R-Sport trim includes blindspot monitoring and driver condition monitoring while also making some of the Prestige model’s options standard, including adaptive cornering HID headlamps with auto high beams plus its front and rear parking sensors. Additionally, R-Sport buyers get standard metal doorsill plates and satellite radio, along with an arguably better looking aerodynamic body kit, a unique R-Sport steering wheel, plus plenty more for a base price of $54k. I’ve neglected to mention one particularly important XE Prestige option, a $1,000 Adaptive Dynamics air suspension that continuously monitors road surfaces as well as driving style via throttle input, acceleration, cornering, and brake pedal analysis before adjusting a set of electronically controlled dampers that optimize ride quality and handling. I tried the air suspension with the R-Sport and found it wonderfully rewarding, although the standard suspension certainly can’t be faulted when compared to similar mechanical designs. Of course the XE’s suspension is fully independent, incorporating the same double-wishbone design used in Jaguar’s superb F-Type sports car up front, plus a subframe-mounted integral-link setup in the rear comprised of hollow forged aluminum for superior strength and lighter weight. Like that F-Type, most of the XE’s body shell is made from bonded and riveted aluminum, 75 percent of which gets sourced from recycled materials. Such extensive use of aluminum is exclusive to the D-segment, with all of the XE’s German, Japanese and other competitors using steel for most body panels. Similar to the aluminum-intensive suspension, the aluminum body reduces weight while increasing torsional rigidity, this last point improving performance, quietness, and making the car safer in a crash. Jaguar initially developed this advanced albeit expensive modular iQ platform architecture for the full-size XJ luxury sedan, which by no accident is one of the more agile handling cars in its segment, but now every single vehicle in the British brand’s lineup makes use of a variation on this aluminum-intensive iQ theme. Like the F-Type, the XE is sensational through the corners. The body feels especially tight and rigid, while the suspension offers up an ideal balance of comfortable compliance and athletic handling capability. Standard AWD assists this process by distributing torque up to 90-percent front to rear, or alternatively it can maintain a 50/50-split on low traction surfaces, plus the XE’s Intelligent Driveline Dynamics software continually adjusts for changing road conditions both predictively and reactively. Additionally, the XE’s speed-proportional power steering provides very good feedback, while the car’s braking-sourced torque vectoring improves high-speed traction, its Adaptive Surface Response (ASR) analyses before adjusting for changing road surfaces, and its All Surface Progress Control (ASPC) helps the XE overcome slippery road surfaces. Just like my previous XE tester, this new model was powered by Jaguar’s class-exclusive four-cylinder turbo-diesel. Displacing 2.0 litres, this in-house produced Ingenium-branded engine puts out 180 horsepower and a very healthy 318 lb-ft of torque for a reasonably speedy 7.9-second sprint from zero to 100km/h and even more energetic highway passing capability. Its performance and efficiency is made possible by a particularly fast reacting eight-speed automatic transmission with steering wheel paddle-actuated manual mode, enhancing the XE’s fun factor exponentially. The inclusion of paddles is more important here than with competitors, however, because no central shift lever is included. Instead, Jaguar incorporates its handy space-saving dial selector, which dramatically powers up from its otherwise flush position within the lower console at startup. Engaging Sport mode requires a twist from “D” to “S”, while pressing the checkered flag button just behind adds even more performance. With today’s rising fuel prices it may be wiser to select Eco mode, however, which allows the auto start/stop system to shut off the engine when it would otherwise be idling in order to further reduce consumption and emissions. So set, Jaguar can now claim class-leading highway mileage of 5.8 L/100km, while the XE 20d also provides a very efficient 7.8 L/100km city rating, plus 6.9 L/100km combined. When compared to other diesels, and even direct-injection gasoline engines, the 20d is fairly quiet, but take note that Jaguar’s 2.0-litre turbocharged, direct-injected four-cylinder gasoline-powered four-cylinder is on the way in two states of tune for 2018, the first with 247 horsepower, 269 lb-ft of torque, and a quicker 6.2-second sprint from standstill to 100 km/h, and the second version with 296 horsepower, 295 lb-ft of torque, and 5.5 seconds to 100 km/h. Adding icing to the cake, the new model drops its base price to $43,900. At the other end of the spectrum, the 380 horsepower supercharged V6 from the F-Pace and other Jaguar models will replace this year’s 340 horsepower version in the 2018 XE lineup. As it is, the 2017 XE 20d offers excellent value for money when comparing its base turbo-diesel, eight-speed auto, AWD powertrain and impressive load of standard features to its many rivals, and of course this is a very good time to take advantage of year-end clearance sales. Right now Jaguar Vancouver is offering 1.9 percent financing or zero percent for up to 60 months with no money needed for 90 days. Alternatively, you can secure a $399 monthly lease payment after putting $4,999 down. Substantial cash discounts are available too. 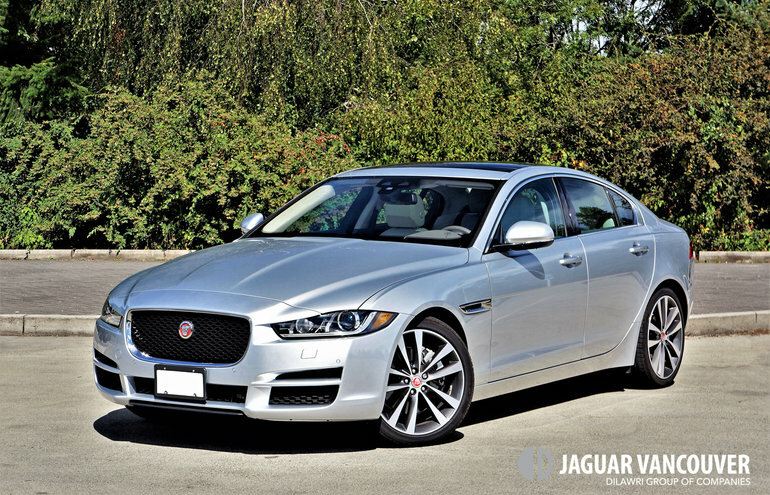 Yes, shopping for any car in autumn has its advantages, but choosing this highly efficient and wonderfully luxurious 2017 Jaguar XE AWD 20d would remain a rewarding experience for years to come.